Istanbul, Turkey’s ferries run across the Bosphorus Strait to connect the European and Asian sides of the city. Photo by Axeltriple/Flickr. Rapidly developing cities worldwide, while diverse, have a number of factors in common. Issues that seem nearly universal are congestion and enormous traffic jams, which have, in some extreme cases, stretched the typical commute into a weeklong sojourn. While cities have taken great strides to address these issues, some have decided to rock the boat by leaving crowded urban roadways for more open avenues on the water. Sometimes these solutions to urban transport problems emerge over years and become integral to the city’s identity, like Venice, Italy’s iconic gondolas. In others cases, cities like Manila, Philippines are so eager to clear automobiles out from the roads that they are repurposing buses as boats. Three cities experimenting with water-based transport systems are Istanbul, Turkey; Bangkok, Thailand; and Lagos, Nigeria. Each of these cities illustrates the benefits and challenges at different stages of developing urban water transport systems. A common thread throughout each city is the need to effectively connect and integrate water transport with land-based transport for people-centered urban mobility. 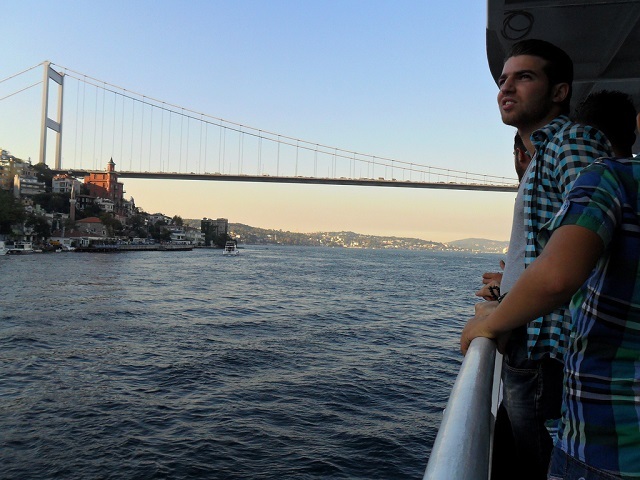 Istanbul is home to a bustling ferry network that traverses the Bosphorus Strait, connecting the European and Asian sides of the city. The recently privatized Istanbul Ferry Lines (IDO), which controls roughly 40% of total ferry traffic, carried 50 million passengers in 2010. The terminals are well placed to serve commuters. The real success of the system, however, lies in its connection to other transport modes, which allows users to transfer between ferry, bus, or rail to complete their trips. A look at Istanbul’s transit map shows bus terminals or stops adjacent to every major ferry station, and the boats are also fully linked with Istanbul’s metro, its Metrobüs bus rapid transit (BRT) system, and its funiculars. Once called the “Venice of the East,” Bangkok retains an extensive series of canals, initially created in 1522. Much of the canal system remains intact and is traversed by khlong boat services, which carry as many as 100,000 passengers per day. The boats are not for the casual commuter, however, as they often stop for mere seconds at each dock – (or don’t stop at all) – which forces passengers to jump on or fall into putrid water. However, these khlong boats do provide an effective transport service, one which some observers would like to see expanded, formalized, and fully integrated with the rest of Bangkok’s transport network. One of Africa’s rapidly growing megacities, Lagos’s population reached 21 million in 2012, up from 1.7 million in 1970. The city’s layout, organized around a central lagoon with a major job center concentrated on an island, would seem to offer a multitude of opportunities for water-based transport. However, the city’s waterways are currently “neglected and grossly underutilized.” Several private companies have begun fledgling service in the city, but the 18,000 daily passengers currently carried by the ferries don’t make a dent in transport demand. Still, the growing demand for mobility options, also evidenced by the city’s extensive informal transport networks, suggest the potential for truly transformative sustainable transport, including on the water. The lessons drawn from these examples are clearly only applicable to a subset of cities, namely, those with navigable waterways. But for the cities that do have waterways, water transport stands as an often untapped but potentially pivotal transport mode. New technologies that enhance the sustainability of ferry transport and reduce carbon emissions, combined with careful planning that builds connectivity between transport modes can make water transport for cities more effective and user-friendly. Whether its ferries, prams, Haabjas, or tetrapak boats, water-based transport systems can become economically advantageous and sustainable pillars within growing cities’ transport networks.